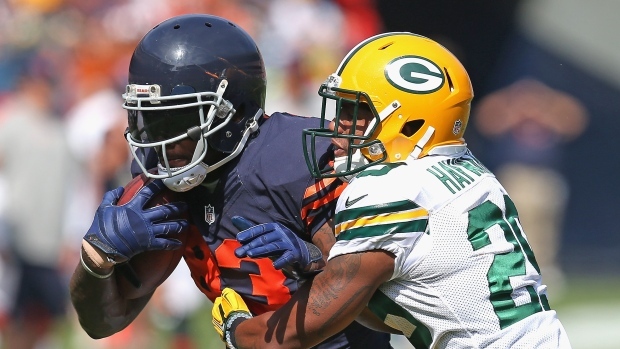 LAKE FOREST, Ill. - Chicago Bears tight end Martellus Bennett is questionable for Sunday's game at Green Bay because of a rib injury. Bennett, who hurt himself in practice, was a limited participant Thursday and sat out Friday. Coach Marc Trestman says the Bears are "hopeful he'll play." Bennett's absence would be a big blow for the Bears (3-5). Among NFL tight ends, he ranks second in catches (47) and fourth in yards receiving (517). The Bears expect to have linebacker Lance Briggs back after missing three games with a rib injury. They also listed linebacker Jonathan Bostic (back), cornerback Kyle Fuller (hip, hand), safety Danny McCray (knee) and right tackle Jordan Mills (foot) as probable. Offensive lineman Eben Britton (appendectomy) and linebacker Darryl Sharpton (hamstring) are out.